I had so much fun making Christmas gifts last year that I decided to do it again this year. Apparently it’s nice to sleep on TOP of it too. Whether you’re a person or a dog. 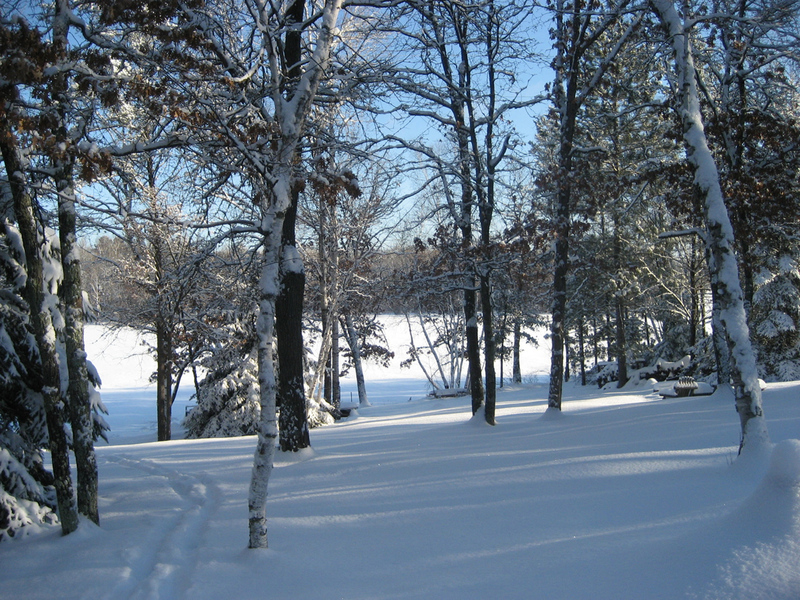 After sleeping in the Shower House when they visited in summer 2016, Kent and Brenda specifically requested a blanket that was heavy. Like physically heavy so you had to work to roll over under it. I had picked up an almost-done comforter that was made of a heavy twill on one side and corduroy on the other. All it needed was a border. The twill/flannel side is green buffalo plaid and the corduroy is black. Twin sized. Its usual home is in the shower house. So to fulfill Christmas wishes, I had to find those two types of fabric. Alas, I struck out. I wasn’t able to find anything even resembling corduroy which is really sad, because it’s one of my favorite fabrics. 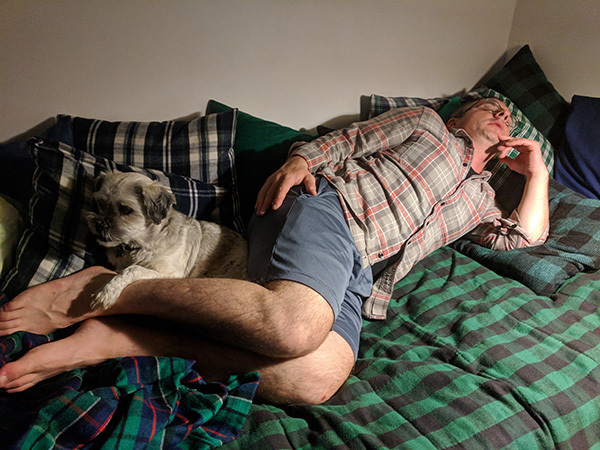 I did find a nice green/blue/red plaid flannel though and used a huge roll of navy blue duck that I’d gotten from Connie for the other side. After sewing the three layers of comforter together, I laid down under the big thing on the living room floor and determined that it wasn’t quite heavy enough, so I went back to Joann Fabrics and bought another layer of batting. It’s heavy. I forget what it cost to ship, since we were celebrating Christmas at the Alabama Emersons and I knew I couldn’t fly with The World’s Largest Comforter stuffed under the seat in front of me. Of course most of the cutting and tying happened in the living room at the apartment because I had no space big enough to lay it all out. I remember that it took me a few days to get to the store for the extra batting and Q and I were kind of using it as a rug as I was loathe to pick it up and have to lay it all out again when the new batting came. Looks like it’s weighty enough for Kent. 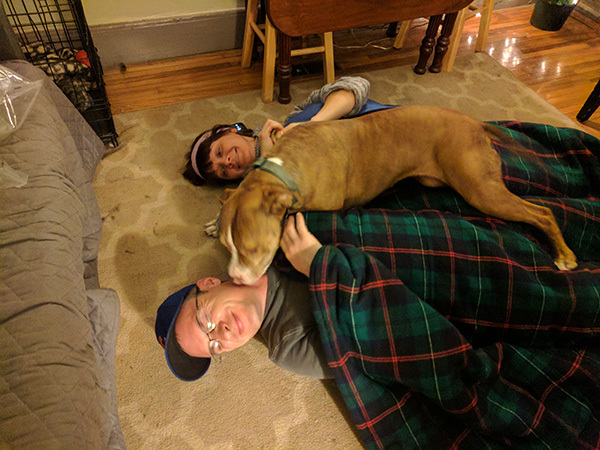 Ansel and Lizzie got a small wool rug – kind of nerdy, but an interesting free-style pattern that I made up as I went along. I think the dogs probably like it. I guess it is a bit funky as far as patterns go. Hey, I was using up my wool yarn store. I also tried my hand at lip balm and lotion so created some nice little pots of same for everyone. The soap was a bust because I could NOT find silicone containers to set up the soap. Rumor (Pinterest) had it that silicone muffin or cake pans were the best to pop the soap out after it set up because it’s flexible. So no soap that year. I had also picked up about twenty pairs of leather chopper mitts with no liners… years ago at a rummage sale. So each kid got a pair of choppers (The Alabamans looked at me askance, of course.) with homemade innards. Cute, but not real useful in southern climes. I can’t remember what else went into that box – no cast iron frying pans for certain. So, Christmas 2017 looks similar. 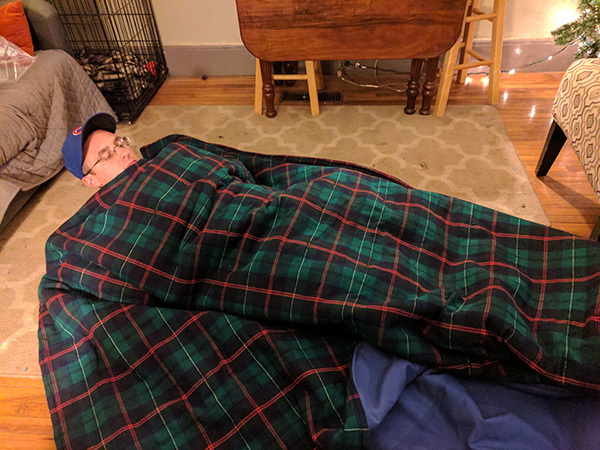 Kent noted that he thought Ansel might envy the weight of the matter when the huge comforter came out last year, so strongly suggested I give Ansel and Lizzie a similar gift. 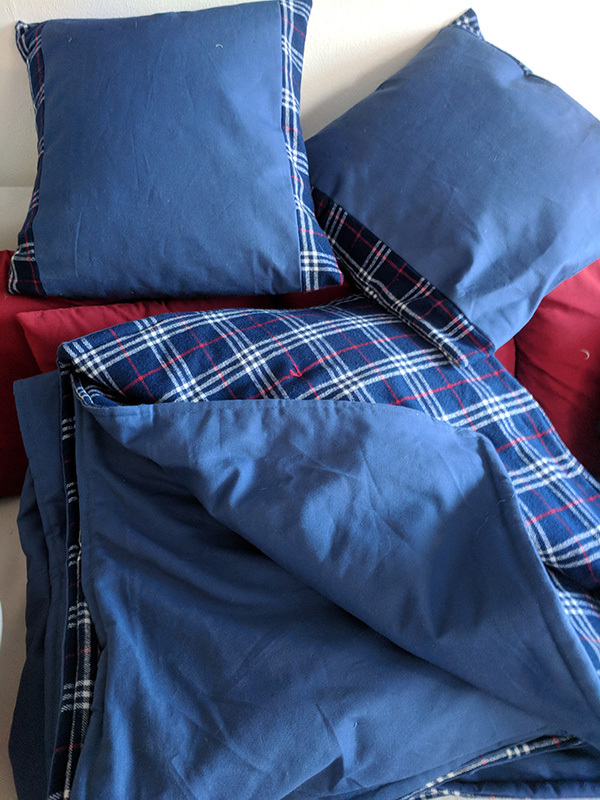 After I’d bought the fabric, I thought to call Anse to ask if they had a king or queen bed – since I’d bought material for a king, I had enough left over for a couple of pillows to match the comforter. 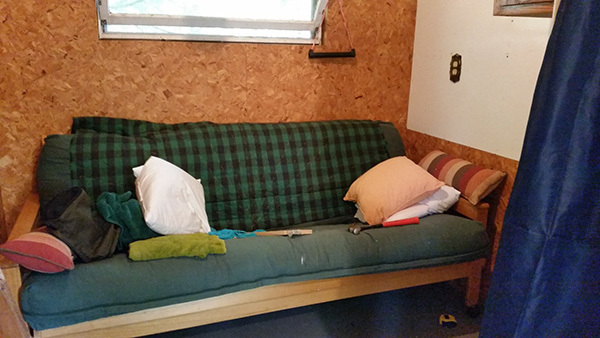 I made covers for a couple of throw pillow covers out of the duck/flannel combo that I’d used for the comforter. My favorite pattern is a super easy envelope cover that can be removed for washing – no zipper, no worries. Voila! Cool pillows to match a cool (but really warm) comforter. I was a little lost in early December because I felt like I hadn’t really made much, but I stumbled upon a great idea on Pinterest. 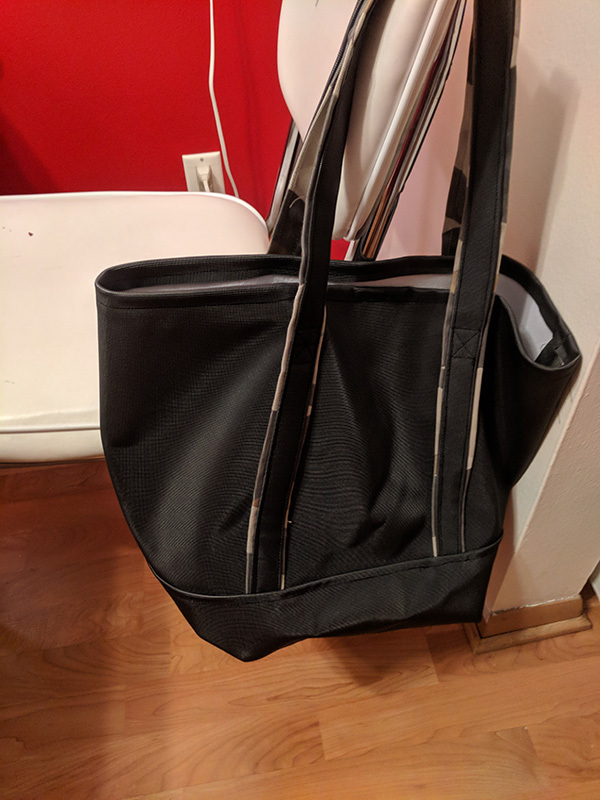 Both couples like to use eco friendly grocery bags, but the ones from the store are truly dismal, made out of whatever fake-fabric they make that stuff out of – probably less eco-friendly than regular old annoying plastic grocery bags. This is upholstery fabric. The top is regular fabric and the bottom is a black textured vinyl. It sews up beautifully. Handles are stitched all the way down the bag and reinforced by the bottom section. Very sturdy. So, I went to the basement and dug out any fabric that was stoic enough to withstand a few hundred trips to the store. This included stuff I’d had since (ahem) whenever. But I also saw a bright exclamation point above my head, because there are several rolls of upholstery down there. 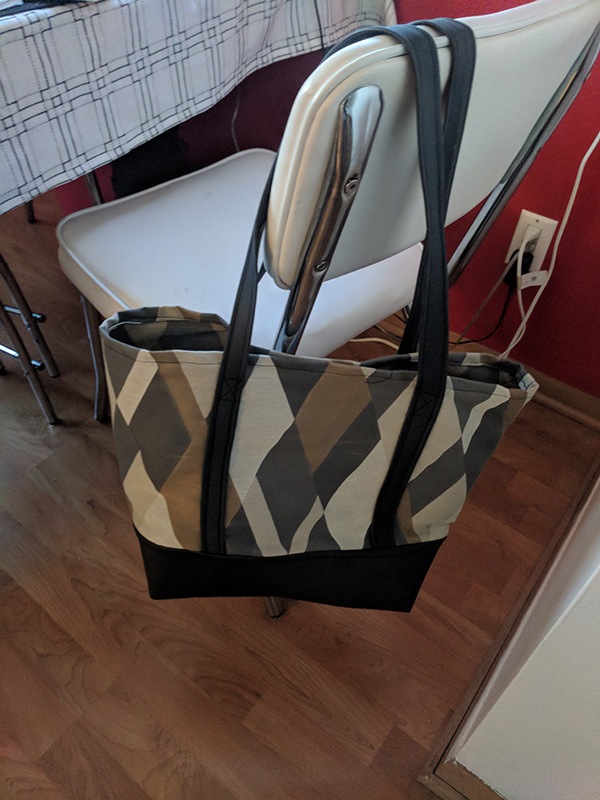 This one is all vinyl — the straps are double using some of the fabric and the vinyl over it. The pattern calls for these double-strength handles. Not that I’m a complete nerd or anything, but last spring I stumbled upon (I stumble a LOT) a huge store of upholstery fabric – I mean huge. Like hundreds of rolls of the stuff 60” wide and pile after gorgeous pile in every color imaginable. Well, except Kelly green, which seems to have been banished from the world. So I bought a bunch. Made floor cloths at Libbys (nice!) and outdoor tablecloths – those project details forthcoming (If I get to it). 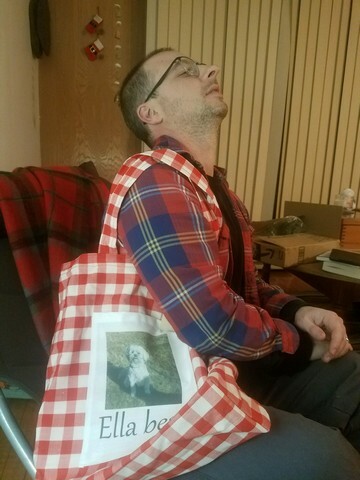 There was some left sitting in the basement at the apartment so I grabbed it and it made some awesome bags. The vinyl sews up perfectly. Great stuff. 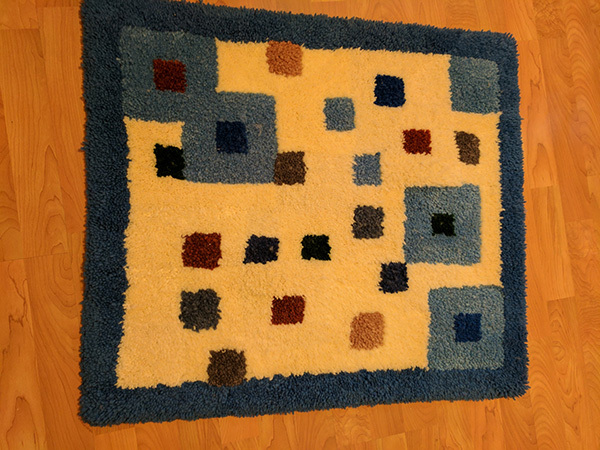 Rug made from “roving” yarn, which is the lushest, fuzziest stuff in the world. It’s 100% wool and so, so cozy. It was a pleasure to make this one. During the summer, I asked Kent and Brenda what color rug they wanted. 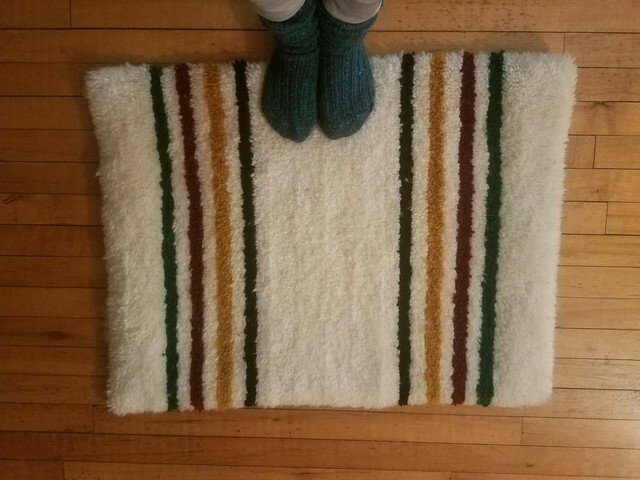 They decided on a Hudson’s Bay pattern, so I just ordered the yarn and made stripes. Very soft. I also saw another idea on Pinterest and that was adding a silhouette of your pet to a pillow. I bought stencil paint and messed with that for awhile, but ended up finding instructions for printing photos onto fabric by ironing it onto freezer paper – the wax melts and sticks to the fabric making it stiff enough to go through the printer. 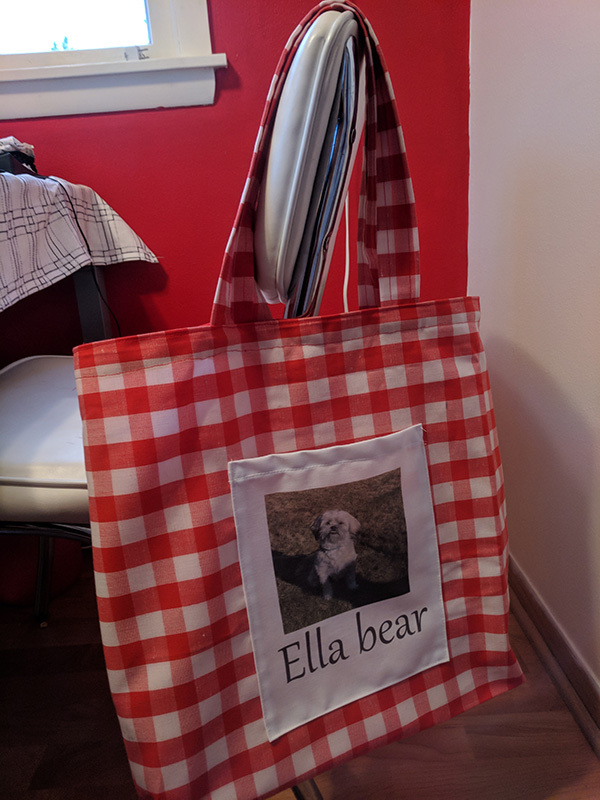 So, I printed a pocket with Ella’s picture and name and sewed it to a grocery bag. Very sweet. Didn’t get to Ninja yet, but that’s coming. This is Kent imitating Ella in the picture. 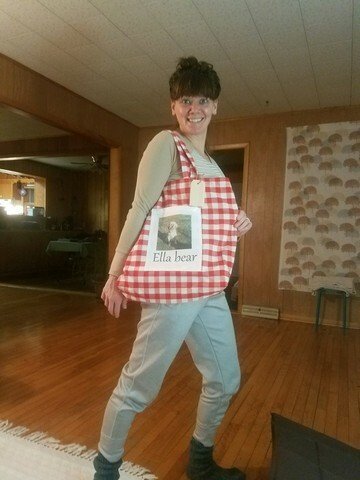 I stole photos from Facebook, believe it or not and used PhotoShop to crop and add the “Ella bear” caption at the bottom. I just printed from PhotoShop onto the cloth that was ironed onto the freezer wrap. Very cool. I had to put the photo on a white pocket, as it wouldn’t print well on any pattern.